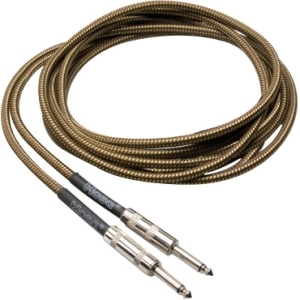 Hosa-GTR-518-Classic Tweed Cloth Woven Guitar Cable, 18 ft. The Tweed styling of this cable is simply awesome. Great color, great handling, great sound. This cable has been so popular that we now offer it in three configurations: Straight to Straight, Straight to Right Angle, and Right Angle to Right Angle. Each end features heat-shrink to ensure a long lasting durable cable.